(1972) marked © 1966 Mattel, Inc. U.S. Patented Other Pats. Pend. Made in Japan. In 1973-74 marked changed to say Made in Taiwan instead of Japan. The rest is the same. From 1974-1976 Her Markings read: © 1966 Mattel, Inc. U.S. Patented Other Pats. Pend. Made in Taiwan. By 1968 Midge was no longer on the market. But her face was back in 1969 without freckles, and with long eyelashes and heavier makeup. She had blonde hair and brown eyes. She also had an updated trendier hairstyle and a new name; P.J. Interestingly, the initials P.J. do not stand for anything. She came in serveral versions: #1113 Talking (1969-1973), #1118 Twist 'n Turn (1970-1971), #1187 Sunset Malibu (1972-1976) and #1156 Live Action (1971-1972). 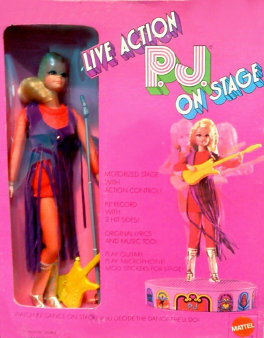 There is also #1153 Live Action on Stage (1971) which is the same doll, but with a stage. #7281 Free Moving P.J., #9218 Deluxe Quick Curl P.J. and #7263 Gold Medal P.J. were added in 1975-1976. 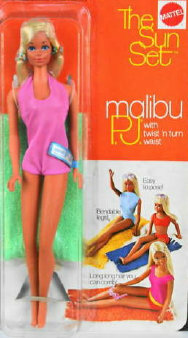 In 1972 her head mold was changed to the Steffie head mold and that's when The Sun Set Malibu P.J. version appreared. All future P.J. 's were made with the pretty Steffie head mold. P.J. 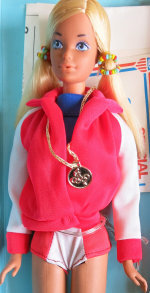 shared all of Barbies clothes. She also had two gifts sets: #1588 P.J. Doll Swingin 'n Silver and #1508 Live Action P.J. Doll Fashion 'n Motion. P.J. 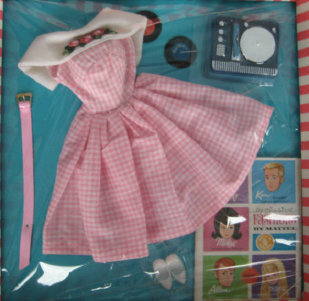 's only outfits with her name were the original clothing she arrived in, as well as the items in her two pretty gift sets. Fun Fact: In 1974 some boxes that Malibu P.J. was packaged in, were marked Malibu Steffie #1187, which P.J. was the correct doll in the box, only the name on the box was written wrong! #1187 Malibu P.J. (1975) Made in Korea marking.